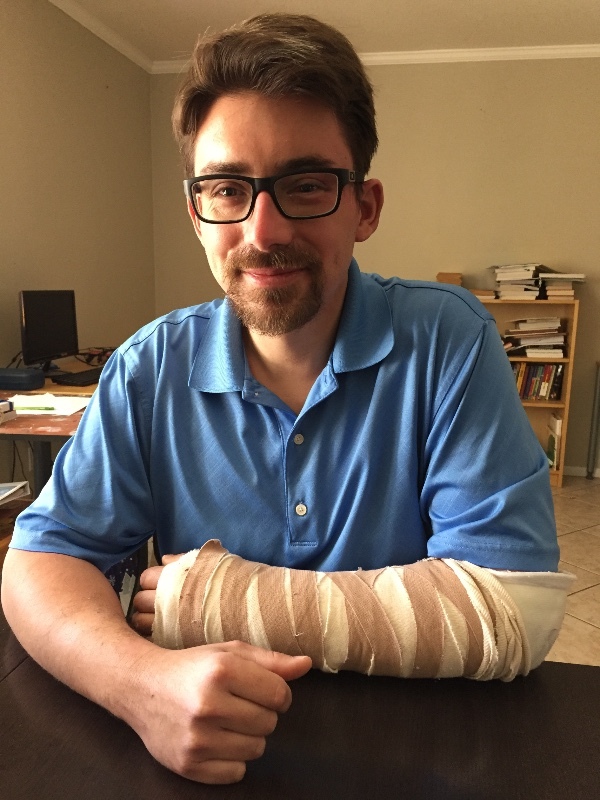 I am hoping to reach out to everyone who can spare an extra helping hand in donating to help Jason get through this tough time after his hiking accident. This will help out with medical bills, rent and food for Jason, his wife, Jackie, and his two kids, Gavin and Lilly, so they can make it through these months.The funds will also help with all expenses as he undergoes rehabilitation to get back to normal. 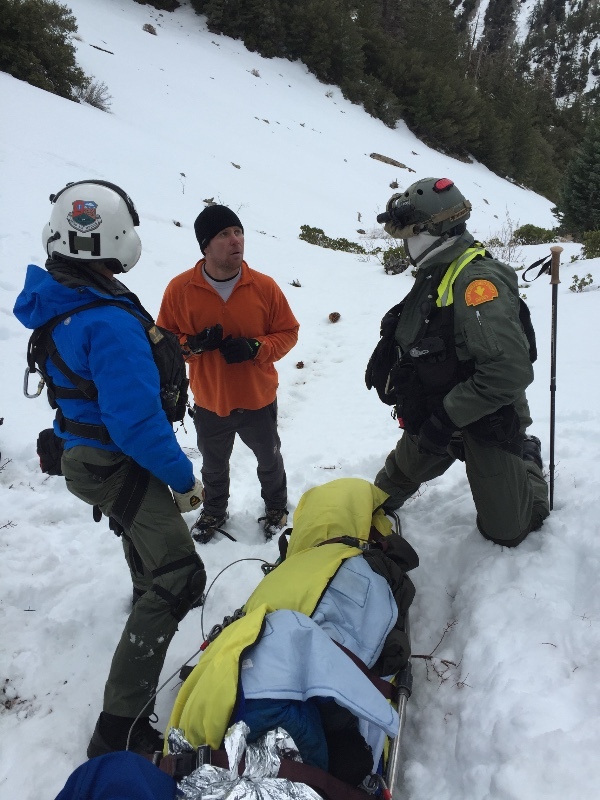 Any remaining funds after all the necessary expenses are taken care of will be donated to the volunteer-based mountain rescue team for new supplies and additional search and rescue gear to help them in rescuing other injured or lost hikers. 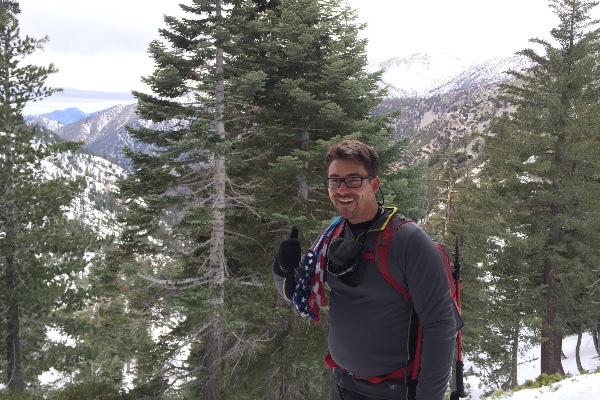 On January 23rd, my brother in-law and I went hiking in the San Gabriel Mountains with the goal of hiking up Timber Mountain. It was a nice day of hiking uphill in the snow, talking about life and joking around. It was the first time Jason got to use his micro spikes I had gotten him and my sister for Christmas. We finally made it to the top saddle of Ice House Canyon where it branches off into all of the other trails you can take. We decided to take the trail up to Timber Mountain and so we began trekking up the semi-steep terrain with another hiker, Yvonne, who accompanied us up as we followed the GPS lines to the top. We were walking along icy snow with our micro spikes and ski poles for stability when we were approaching the summit of Timber Mountain.We were about 500-600 feet away from the top when I suggested we move off the icy snow onto a patch of rocky dirt. As I turned my head around to check on Jason, he lost his footing and started to slide on the icy snow. I shouted to Jason as I saw him try to regain control and traction to put his feet down and dig in his spikes. Between the iciness of the snow and the lack of weight on his feet he was unable to stop and continued a fast descent down the snow covered mountainside until he wasn't visible anymore. I quickly started yelling his name and listening to see if I could hear his voice, and each time I heard nothing. I quickly yelled to Yvonne who was accompanying us up to the peak and she logged GPS coordinates and got her ham radio out. With no luck on the ham radio we quickly walked back down to the saddle where patchy cell phone service would be possible and other hikers were so I could gather a team to set out across the hillside to search for Jason. We luckily made contact with four other hikers at the saddle, three of them, Brian, Anson and Mark, agreed to accompany me down the hillside to search. Brian, being an experienced mountaineer and Anson and Marc well adept at hiking as well were a blessing. We spread out at different levels to comb the side of the hill. Making our way down and across the mountain about 1,000 or more feet down close the bottom of the hill. Marc made first contact with Jason vocalizing to the rest of us that he had found him by a trail of blood leading to him. As I approached Jason I could see he was hurt bad. The side of his face and clothes soaked in blood and he was semi-conscious moaning in pain and confusion. Once the other two hikers Brian and Anson made it to us they took out extra jackets they had so we could cover Jason with jackets to prevent hypothermia. Brian an Anson logged GPS coordinates and gave them to Tyler and I so they could hike back up and get phone reception. Luckily Marc had one bar on his phone and was able to reach 911 and confirm a helicopter rescue was on their way to us. After 20 minutes we started to hear in the distance the sound of the helicopter coming near. Finally help had arrived but not just yet. The helicopter made a first pass and didn't see us and moved off to search other parts of the sounding area. So Marc called back 911 several times to help give them our GPS coordinates and an idea of our surroundings. Finally after 45 mins of them searching, we were found. They waved at us to let us know they had seen us. Jason, still going in and out of sleep and being awake but non-responsive, was starting to shiver because of the cold and his down jacket becoming wet and losing its thermal protection. The helicopter made a swoop in and lowered down two volunteer rescue personnel and a stretcher basket for Jason. The heli had to then leave and go down the mountain to refuel before coming back. All of the guys assisted in stabilizing Jason digging a trough for the basket and wrapping him up to keep him warm. We finally got him into the basket and strapped down. We waited about 30-40 minutes for the heli to get back. Then they brought one rescuer up and then Jason in the basket next. They had a rope attached to the basket to keep it from spinning in the wash of air coming off of the helicopter blades. He was about 60% of the way up when the rope to help stabilize came off and they had to keep bringing him up.The basket started to spin as it got closer and petrified me as I was hoping nothing bad would happen and Jason would stay secure in the basket. Luckily they grabbed the spinning basket and secured him into the heli. Up went the second rescue personnel and off went the chopper. The three other hikers and myself made our way back up the hillside back up to the hillside where Brian's wife was waiting for us all. We took turns carrying Jason's backpack down the mountain to the bottom of Ice House Canyon to the cars. 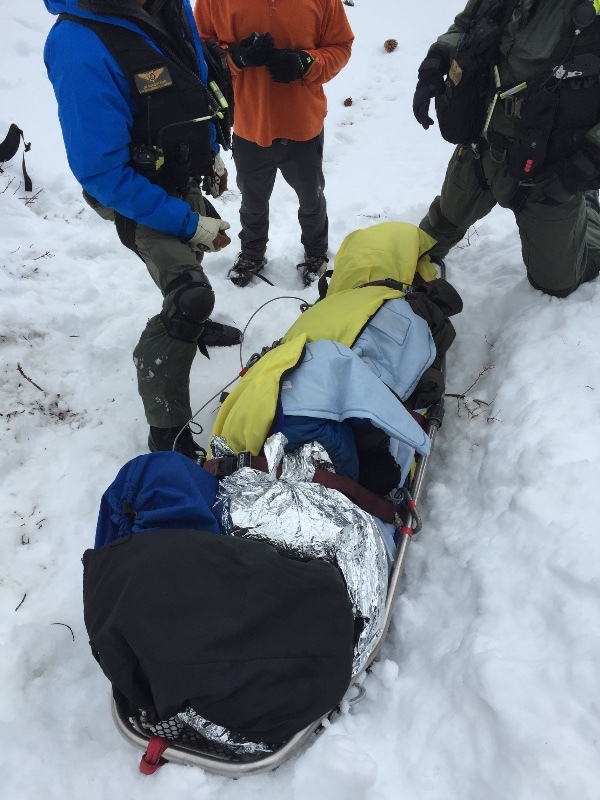 All I can say is how thankful I am for all five of those hikers to be there that day to help me find Jason and to the volunteer helicopter rescue team who came in and brought Jason to safety. Thank You to Yvonne, Marc, Brian and Anson for your amazing help. Thank you to the mountain spirits for not taking Jason's life. Jason is finally home! He no longer is required to be hospitalized but will continue therapy as an outpatient. Rehabilitation therapy will include occupational therapy, physical therapy, and speech therapy. I will be taking an extended leave of absence in order to be home with Jason and make sure he is getting the care he needs. Jason continues to make progress which makes us all hopeful and happy. Now that he's home he is much more relaxed and comfortable being with his family and dogs. Not to mention sleeping in his own bed and eating good food. We still have a long road ahead of us recovery wise. The doctors say an injury such as his can take 6 to 12 months to heal. His left eye still is not useful as the pupil has remained dilated and unresponsive. We will see his orthopedic surgeon next week regarding his fractured wrist to determine if he will need surgery on it or not. Considering what he went through he is not in a lot of pain. He gets headaches a few times a day most likely due to the brain injury and the orbital fracture and skull fracture. And of course his wrist is painful if he forgets that he shouldn't use that arm and puts weight on it. Thank you to everyone that has been so supportive and generous towards our family in these last weeks. We are so grateful. Despite everything that happened to Jason he just cannot wait to get back to work. He really has a passion for his job at the Westminster School District, loves what he does and misses it so much. I think that Jason is making great progress though and feel that he is capable of making a full recovery. Here's to the future! Grateful to be alive, and feeling fortunate to be able to walk down the road of recovery. UPDATE: Jason has been moved to a Rehabilitation clinic in Downey Ca. It is among one of the best in the nation for nero critical care rehabilitation. He will be focused on reestablishment of his acute motor skills. Getting his equilibrium retrained so balance comes easier and most important, getting his short term memory back in check along with speech and working on fluid thought. Sometimes Jason will say some pretty funny sentences and words that don't make a whole lot of sense but through healing and retraining I know those will become a distant memory just as his fall has become for the time being. He currently does not remember the accident yet, and that is probably a good thing, at least for now so he can concentrait on getting better. Thank you again for all of your generosity with donations, prayers, positive thoughts and healing energy projected into jason. We truly know your positivity and prayers work miracles. Thank you, thank you, thank you, your support is so important and amazing. When someone is down hurt and needs help, we as a community of good caring people link hands and surround each other to provide assistance with our contributions and most importantly our prayers and positive energy. As just one person sometimes we have weak moments, but together we are strong, together we can make it through anything and together we will make it through this. Jason's Son and Daughter were able to see him for the first time today since the accident. He is still slowly regaining his speech and sense of self. He falls asleep easily(which is good considering we heal the best when we sleep). Things are moving slowly but surely. He has been tasked with sitting in a chair as much as possible now. Since he has been laying down all this time he needs to start retraining his equilibrium. It's the small things now, the details that we'll be working on. Bringing Jason back to as normal as can be. We found out he had a Fractured wrist from the fall so they put a cast on it the other day. It is truly the little things in life that matter the most. Sometimes we don't realize how good we have it until something comes along and turns our world upside down. Doing good things, being a good person and spreading positivity in the world for ourselves and the people we share this experience with in this lifetime is a must. Thank you to everybody who has donated and continues to donate. Thank you to everybody who is keeping Jason in your minds eye and sending positive energy and prayers for him, they are working. All I can say is everyday he is improving even if it's just small steps. We have a road to walk down with an arrival time unknown. Just know that your positive energy and prayers help expedite that journey. Thank you. As of last night jason spoke his first words in over a week. They were few but it was a start. Today his Wife, my sister Jackie was able to get him to speak some words. He regognizes her as his wife, he also regognizes his two kids by picture Gavin and Lilly. He is still not there all there and he is still confused on some questions but small steps are being made. Please keep Jason centered in your Prayers and Meditations sendig happy healing positive energy to him for healing. Your prayers and directed positive energies are working. Thank you to everybody who has donated to help with his medical bills and the beginning road through rehabilitation. Your donations are blessings as this will help Jason, his wife and his kids get through this difficult time a little easier. Thank you so much for your support. Fantastic to hear he's improving! And I'm sooo glad the kids were able to see him. I'm sure that helped boost his heart & soul, and I know it helped ease their minds to actually see him. wow what a story. this should be on the show "i shouldn't be alive" (great remarkable stories told). my best to you in recovering. stay strong! This latest update is excellent news, indeed! Prayers for continued healing, hugs to the family! I am friends with Julie Nakamura and saw her post. I am so sorry for you - sending you prayers and best wishes for your recovery.